You never know when an emergency will arise. This emergency might be one related to a natural disaster, or it might be a financial emergency, such as a job loss. In some cases, you might experience a financial emergency at the same time that you experience a natural disaster. While you can never be completely prepared for the toll an emergency takes on you, it is possible to limit the harm done by an unexpected turn of events. 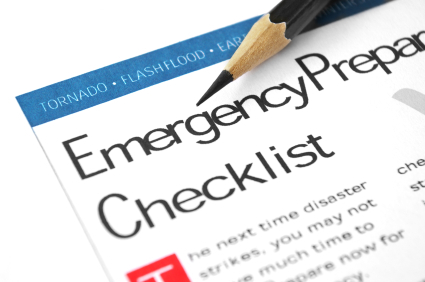 As you consider your situation, and think about the possibility of emergency, it helps to be as prepared as possible. It’s a good idea to not only have some of these supplies in the house, and readily available, but to also have them in the car. I have emergency supplies in the car, including blankets, food, flares, and First Aid. Whenever I travel, I also take water (the result of an unfortunate stranded-in-the-desert incident during college). Know where these items are, and make sure other family members know as well. If you have limited storage space, at least put together a 72-hour kit for each member of your family. You may not be able to store six months of non-perishable food items in a small apartment, but you can at least get through the initial stages of a crisis with the help of a 72-hour kit and what you have on hand for the week. Make sure that you understand escape routes from the house, and that you drill family members on how to get clear of the house, and where to meet. My son knows that there are two meeting points out (depending on whether he leaves out the front or out the back) in our neighborhood. Additionally, we participate in the community drills that indicate a meeting place for the children who are in school when disaster strikes. This can help cut down on confusion later, and help you increase your safety in the event of an emergency. Know where the turn-off valves are for your gas and water. Broken water and gas mains can make an already difficult situation intolerable — and even more dangerous. Know how to turn these items off, and show children who are old enough to help how to turn off the water and gas. It can also help to have a security system, like ones from SimpliSafe that can alert the local authorities that you are in trouble. Some systems even come with water sensors and fire sensors which can help in times of a flood or fire. Your physical emergency preparedness can also help during times of financial hardship. For example, if my family were to experience a sudden drop in income, we have enough home food storage to help us along for a few months. We wouldn’t have to worry as much about shopping (although we’d probably spend a few bucks a week on fresh produce and milk) while we looked for other income sources. One of the best things you can do is get a fireproof/waterproof safe that is easy to transport. You can get a small safe and keep all of your important financial documents, including passwords and account numbers, in the safe. And, if it is easy to transport, you can take it with you if you have to leave. If you can get to it, the right safe will protect the information from floods and fires, as well as other disasters. If your emergency is strictly financial (and even if it has a physical component to it), you should be ready with a liquid emergency fund. You can augment with other emergency sources as well. I have some money in a savings account that is easy to get to, in case I need it immediately. However, I also keep emergency funds in a taxable investment account. If I need to, I can use the liquid assets to hold me over for three to five days while I wait for my stock transactions to go through for more long-term problems. Think ahead, and prepare for emergencies. You’ll be in a better place over all, and reduce the chance that an emergency will devastate you financially. Good tips Miranda! Emergency funds and other emergency preparations are uber important. This reminded me that I need to get myself a fireproof safe. We don’t have a ton of valuables, but I’d hate to lose things like our family photos and videos. We are still working on that. We have to go through our stuff and really put the things we cant lose in a better spot. I have thought about getting a safety deposit box too for keeping things off site. I like the idea of that. That’s a great idea: Keep copies of photos in the safe. And, thanks to technology, you can put your favorite memories on a thumb drive, or some other external drive, and store that in the safe. I keep forgetting that I want to stash some cash in our house. All of the other bases we have mostly covered. Camping gear does wonders! We use our camping gear for emergencies too. It works for both purposes. The little camping stove is perfect. We have our camping gear for emergency use as well. It’s great to know it’s there and easily accessible, and we already have practice using it if needed! Nice tips Miranda. I feel that I am well prepared, except for the cash part. I really should think about putting some in our safe just in case. We need to do the same. We don’t have any spare cash around. I’m going to say for the most part yes we are prepared for an emergency with our finances but we don’t keep cash in the house (something to think about I guess) and in our home. We also stock up on items and keep things handy in case of a tornado or other disasters that roll through. Sounds like you are pretty well set. We don’t have any cash stored either but it is not a bad idea. I need to put that on my to do list. Experience shows that emergencies always arise from a completely unexpected source. Good point. The cash could lose value however a couple hundred bucks on hand is probably worth the risk if you ask me. Good point! A little extra cash is, as Miss T says, worth the risk. But, it’s a good idea to “diversify” with your more tangible supplies of food and other items. It’s so silly – I am more than prepared for a financial emergency, but not really for an emergency where I can’t access my money. You gave me a good to-do list, here! Yes, it’s a good idea to be prepared for both kinds of emergencies, especially since you never know if you might not have access to your cash. Great tips. After hurricane Sandy we really learned the importance of having some cash stored away in the house for emergencies. When the power when out there was no way to access ATMs and obviously the banks were all closed. Some stores opened, but obviously weren’t able to process credit card transactions. Great point! You don’t always know when an outage or some other catastrophe will render your plastic or other electronic payment useless. Some cash can help, and a few supplies to get you through a couple of days, can go a long way. Very helpful tips. Since I am living in a tropical country where storms often occurs, I always make sure to store foods and other important things needed for emergency situations. Good thinking. We don’t have storms much but floods are definitely a risk. Canned and dried goods and bottles of water are part of our kit. I totally agree. They go hand in hand. New smoke alarms are on our list. I am not even close to ready, in either way. Thanks for the reminder. I might want to get busy! You need to. You never know when disaster might strike. This makes a great checklist! You also reminded me that I need to update my passport now that I am married. Love your article! I love checklists and have been working on my emergency fund lately. I learned the hard way that I did not have enough saved for two concurrent recent “emergencies.” I recently set a goal to increase my emergency fund and I will take your financial tips and add those to my goals too! Better safe than sorry. Thanks! !